It hit me on our first night home. I was sitting in bed, a three-day-old baby in my arms and the heavy hush of evening all around me, when I felt it. It hit me like being woken up from a dream, like a clock chime at midnight or like a broken spell. It hit me the way truth always does when you’ve been keeping it at arms length. This baby was so easy – and easy was much harder than I expected. They tried to tell me. Throughout my second pregnancy I heard the words repeated by friends and family, coworkers and acquaintances, over and over again – it’s going to be so much easier this time around. They said it with such confidence, like kindhearted fortune tellers. They said it as if they knew something I didn’t. This baby would be easy. This time around would be different. I won’t deny that the birth of my first was difficult. My son was diagnosed with Spina Bifida, a permanently disabling birth defect of the spine, at our 20-week ultrasound, and the tide of grief that carried me through those final weeks of pregnancy was consuming and deep. Still, I could prepare. By the time he made his entrance, I knew his diagnoses forwards and back. I was prepared to have him whisked away from me after his birth. I was prepared for the five-hour spinal surgery and the placement of a shunt in his brain that would take place just days after his arrival. Even when we brought him home and I watched him struggling to breathe, turning from pale to gray to blue. Even when we returned to the hospital in a panic and learned three months later that he had severe obstructive sleep apnea and would undergo surgery for a tracheotomy. Even when it was hard – I was prepared. But nothing could prepare me for this second time around. Nothing could prepare me for easy. I remember a moment in the hospital. I was holding my daughter when suddenly the silence was deafening. There were no beeping monitors, no cords, no wires, nothing tethering her to this place. It was lovely, like a dream. The kind of dream where you’re weightless and flying, everything around you is light and nothing is out of reach. The two of us were floating, lighter than air and steady as the breeze. But just as the beauty overwhelmed me, the sorrow did too. Because sometimes when you’re flying, you look down. And when I looked down, it was like I could see the other half of myself on the ground below. The half of myself that lived in the Neonatal Intensive Care Unit and wept in the night and feared and despaired. And she was looking up at me. And she was jealous. And she was angry. It’s like I was torn in two. Here I was, the woman I wanted to be two years ago. The mother I planned on becoming. 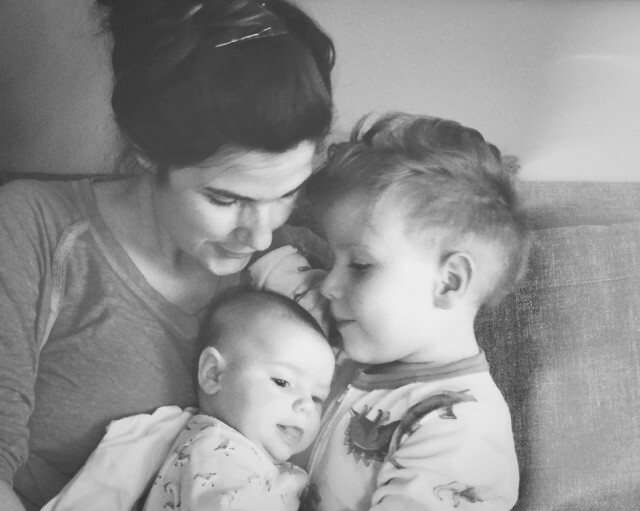 The story I would have written for myself – for my son. But I wasn’t that mother, not fully. And I never could be. You can’t go back, you know? You can’t unsee or unfeel or ungrieve. You can’t unlive the life you’ve lived so far. The never-going-backness of it was crushing. I wanted to be up there. I wanted my son and his first few harrowing weeks of life to be up there too. I wanted us all to have it so easy. It wasn’t fair. I fought gravity, saying “No no no. This is what I wanted. This is where I belong. This is the mother I am supposed to be. Not that woman down below. Let her be forgotten. Let her sink away.” But even my fight was in vain and even my wanting was painful. Because that heavy yearning, that pull towards easy, was hedged in by guilt. Because the things I wanted to forget, the things I wanted to change, were tethered in an unbreakable line to the little boy I loved with a fierceness that trembles me. And so, those first few weeks with my daughter were spent at war. At war with myself and the mothers within me. I tried to strike a balance. I tried to give vent to the grief while drinking in the very beauty that sustained it. I spent my days in a cloud of joy and my nights weeping in the darkness. Every high was a low. Every single easy – the smooth curve of her back unbound by gauze and tape, the morning change of her clothes, where there was no part of her I wasn’t allowed to touch, the steady breathing that just happened without prompting – was a unique kind of hard. I guess that’s the hard part of easy. It opens a door to what might have been. It breaks you in two. It takes you on a weekend getaway to Italy, when all the while you know your home is in Holland. And Holland is beautiful, but Italy is too, and now your heart is broken all over again. You should know that the hard parts of easy get easier. And when you’re divided, you can see in all directions. I guess that’s what I’ve figured out this second time around. I guess I’m learning to live in two places. I am letting each part of myself, each varied experience, have a voice. I am letting each be recognized. And if you’re a mother like me, I think you should too. Because, without the flying, we might never see the beauty below. The linking of rivers. The crosshatch fields of purple and green. The connectedness of each crevice and cliff and crag. And without standing on the ground? We might never feel the sun. We might never see the sky. This post was originally featured on What Do You Do, Dear?